Video Conferencing – Personal Court Reporters, Inc.
PCR offers superior video conferencing services to connect individuals without the stress and expenses that come with travelling long distances. Our high-tech video conferencing services are available at any of our eight, fully-equipped facilities across California. Each office provides spacious, comfortably-furnished conference rooms with full video capabilities. Our rooms feature HD video conferencing available on large, modern displays and wireless, high-speed internet. Our state-of-the-art technology enables us to record video conferences for our clients to easily review material. We help clients defy geographical limitations by connecting them to anyone around the world for interviews, depositions, conferences and more. 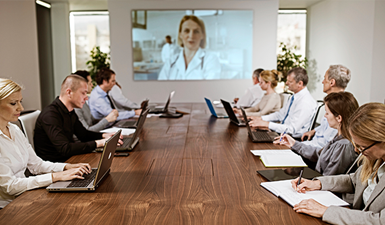 Contact us today to schedule your video conferencing services in California and abroad!